January is not a great month for birding locally, particularly after years of drought in Andalucia coupled with very warm winter temperatures in Northern Europe. There is simply no incentive for birds to be here in this dried up semi-desert. Bird photography therefore has taken a back seat this month. 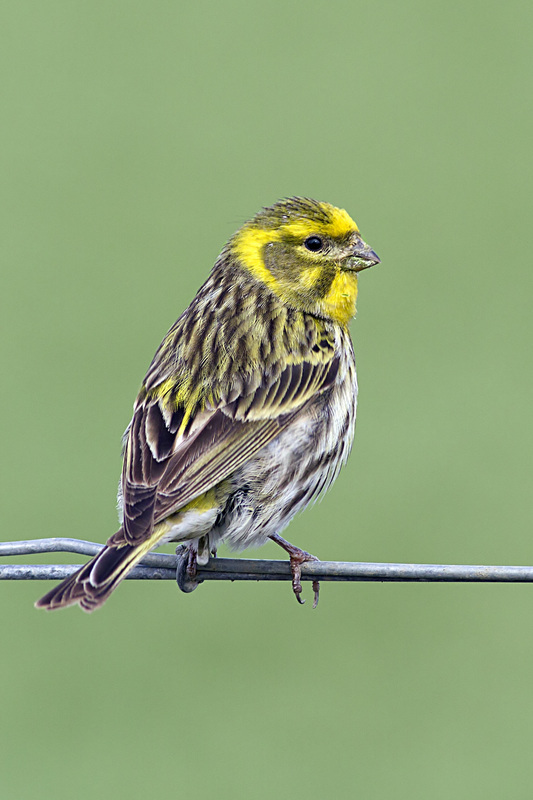 This Serin shot came out quite nicely though. Taken at the Rio Velez it sat on a fence allowing me to get quite close and use camera settings to blow out the background. The resulting pale green bokeh sets off the yellow and brown plumage quite nicely. 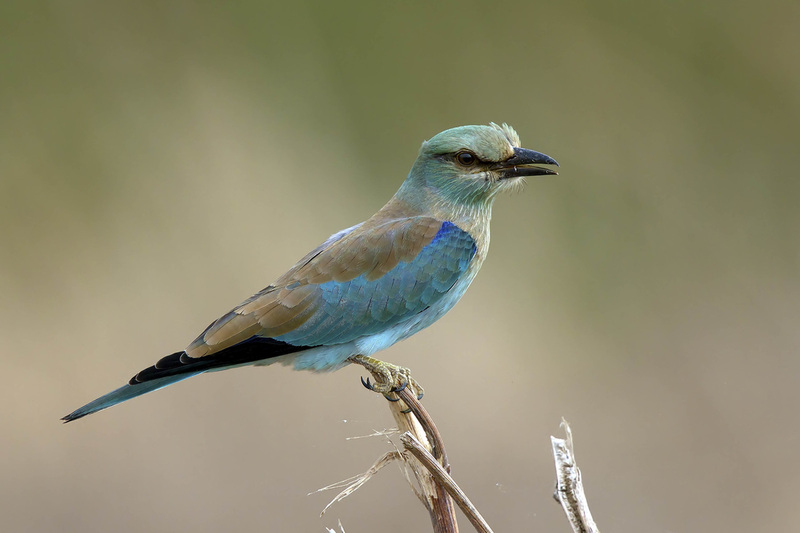 February is another quiet month for birding in Spain, particularly during a prolonged drought such as the one we are experiencing in Andalucia. 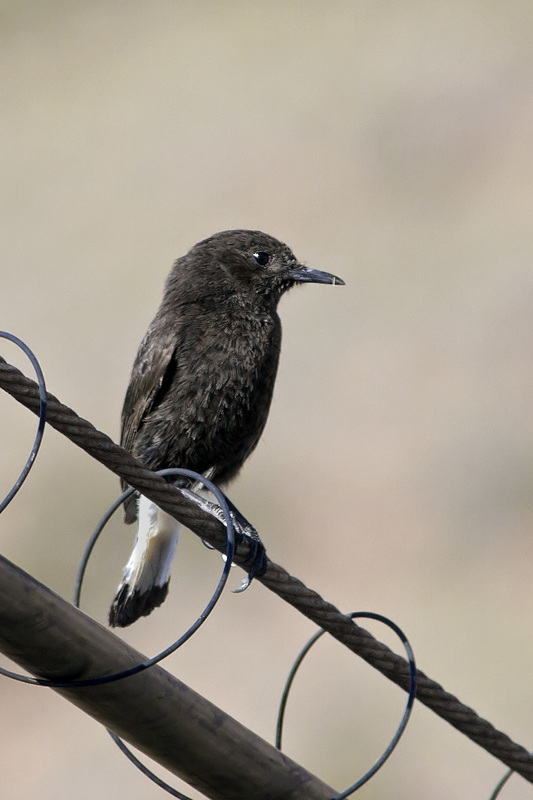 A trip to Cabo de gata with the ABS however did produce one or two nice images, the best of which is probably this Black Wheatear, a nice bird and another one on a wire, but the overall quality is good and with very little else to compete with it the Black Wheatear becomes bird of the month for February. Birding really picked up this month. We had some rain and the mild weather persuaded some of the migrant species to make an early appearance. 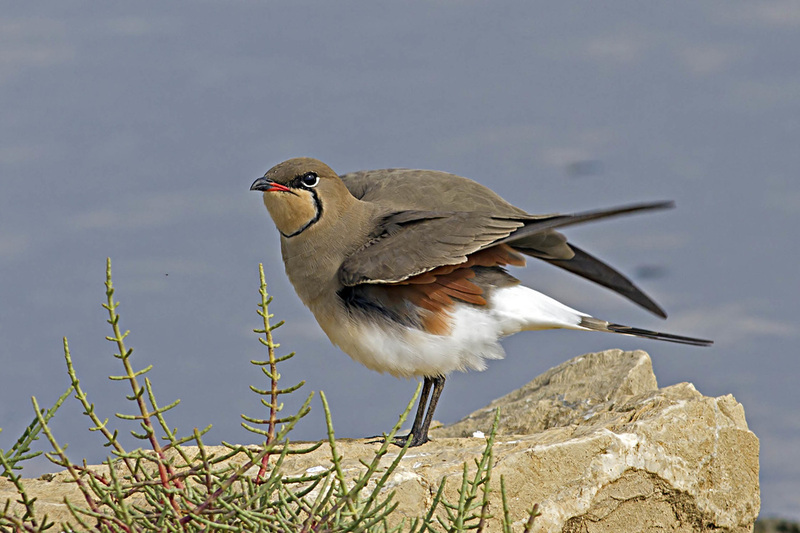 This beautiful Collared Pratincole was sitting by a shallow lagoon close to the seaside town of Barbate in Cadiz Province. Just by lifting its wing and showing some russet coloured plumage beneath gives the shot an edge, and so I choose it as bird of the month for March. This has to be bird of the month. 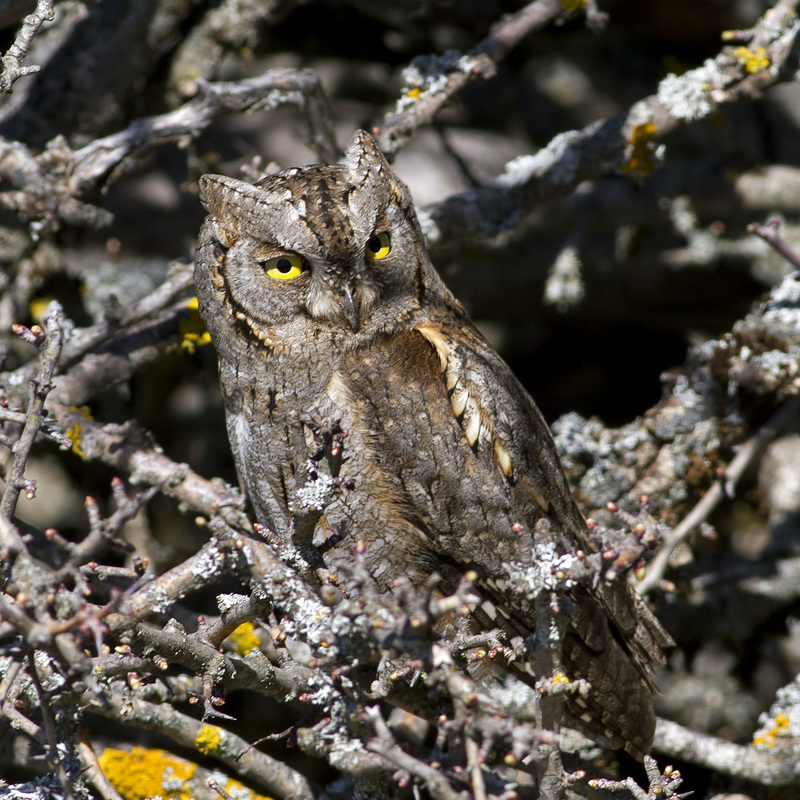 The Scops Owl is occasionally heard but rarely seen. Being no bigger than a starling and a master of camouflage makes it very difficult to find. It roosts quite still during daylight hours, always blending in with the environment which in this case is a dense hawthorn bush. I count myself extremely lucky not only to have seen one, but to have had the opportunity to get a good photograph of this beautiful and elusive creature. Barbara and Derek Etherton sighted it first and I went searching in what I thought would be a hopeless cause, but there it was in first hawthorn bush I scanned, how lucky is that. The Dipper has to be one of my favourite birds. For a start I enjoy being in their habitat along fast flowing clear, cold rivers. I enjoy watching them bobbing and dipping & flashing their pure white eyelids. Their short strong wings can be used as flippers underwater as strong legs with sharp claws grip the rocks in a swift current. To reduce buoyancy their bones are solid instead of hollow. They have dense plumage with a large preen gland for waterproofing the feathers. Their eyes have well-developed muscles that change the curvature of the lens to focus underwater. Nasal flaps prevent water ingress. The sum of these and other adaptations makes them quite unique amongst bird species, they are quite fascinating. 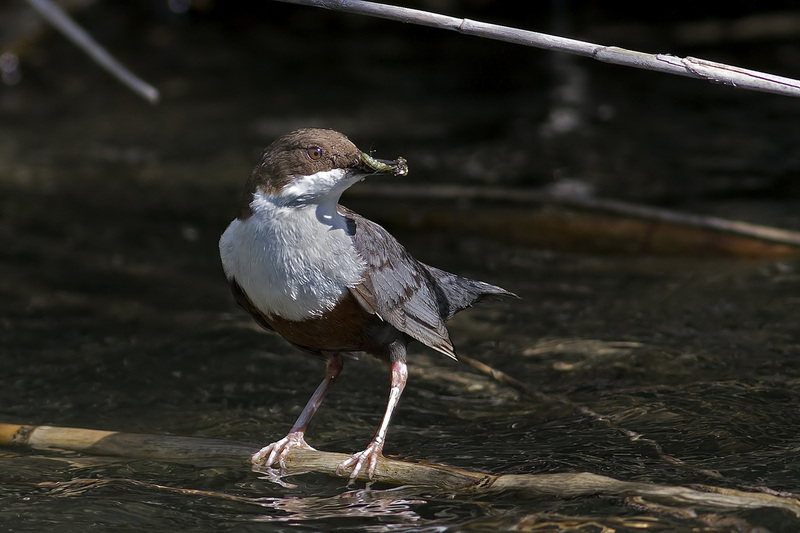 I photographed this bird on the Rio Guadalfeo, a fast flowing river that runs down to the sea from the Sierra Nevada Mountains. There are relatively few other suitable habitats for this species in Andalucia which makes it all the more special. A trip to Scotland this month so lots to choose from. 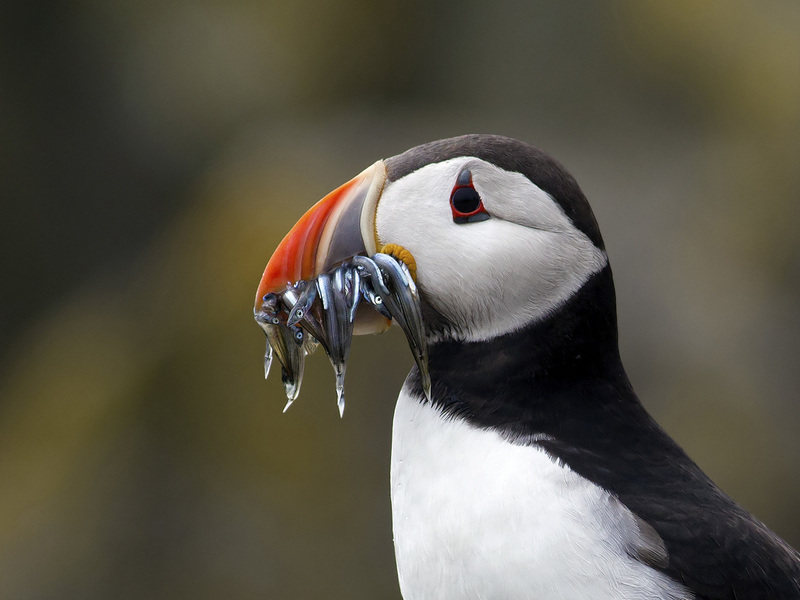 Firstly though I have to post this classic shot of a Puffin in breeding plumage with a beakful of sand eels. I have chosen to zoom in for this image so we can clearly see the details of that extraordinary colourful beak and the faces of the sand eels it has as prey. I wonder how it manages to accumulate a dozen eels in one mouthful, surely it must open up to keep catching them? One of those mystery's of nature. While visiting my daughter & family in the delightful Town of Missisippee Mills in Ontario, Canada I took the opportunity to find and photograph some of the local birds. 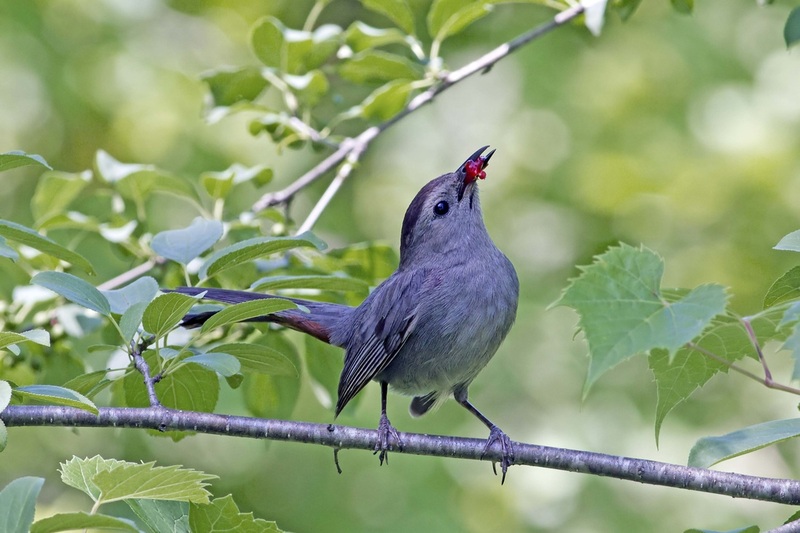 I like this shot of a Grey Catbird brandishing a juicy red berry, the combination of grey, green and red plus the striking pose make it an aesthetically pleasing image for the month of July. Strictly speaking this was taken early in September, but I August is a very quiet month for birding and I was not active. I did attend the Bird Fair in Rutland where I purchased a new Canon 500mm f4L IS 2 lens at a heavy discount, so a quick trip down to Tarifa and La Janda was in order to try it out. The Roller here was sitting close to the track in La Janda, obviously resting up instead of battling stong S'ly winds on its way South. The photograph loses most of its vibrance in being uploaded to the internet, but the fine detail and nice, soft bokeh prove that the new lens could be worth the money. 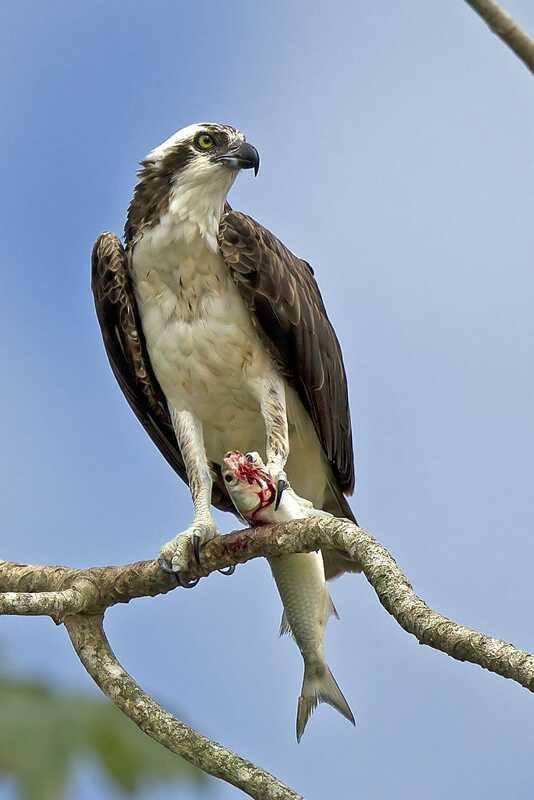 A cracking shot of an Osprey perched on a tree over the River Tarcoles in Costa Rica. I previously had a good Osprey shot here from La Janda but I replaced it with this one which I think is even better. I like it because the bird looks happy with it's fish dinner. Not technically a great photo but this is one of my favourite small birds which I had been after for some time. 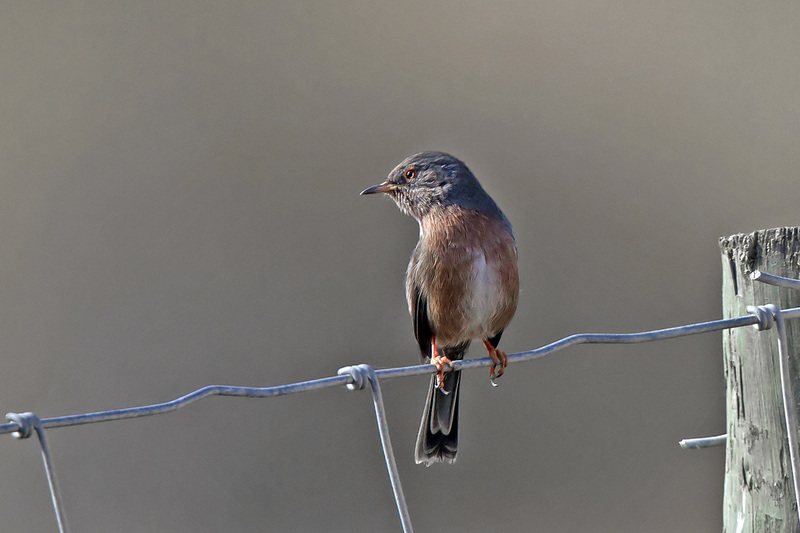 The Dartford Warbler is a pretty little bird of gorse and heathland. It breeds as far north as the South of England but I never managed to find one there so am always happy to see them here in warmer climes. 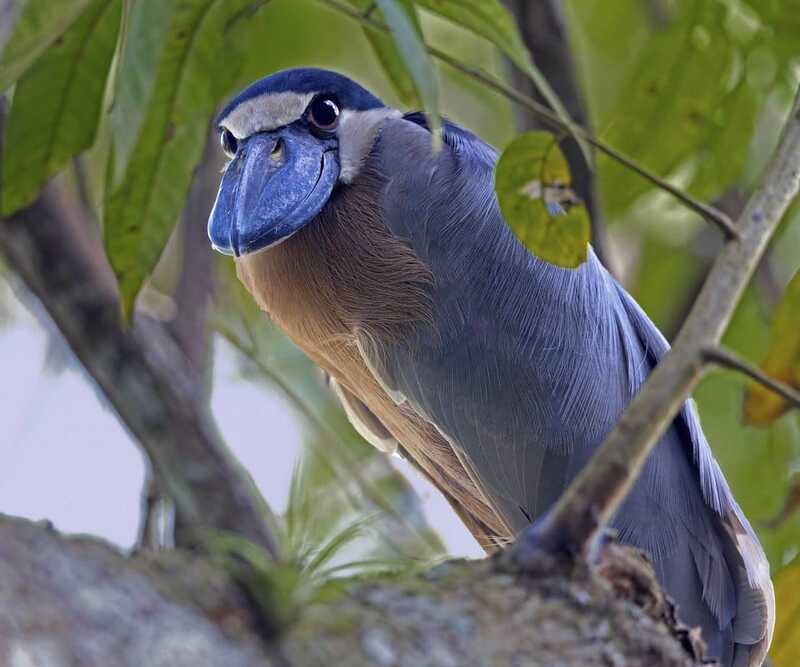 We heard this chap first in the forest by a river in Carara National Park, Costa Rica. I parted some branches and came face-to-face with him. he was not fazed at all, just looked right back at me as if to say "Well, what are you gawping at?" A great bird. 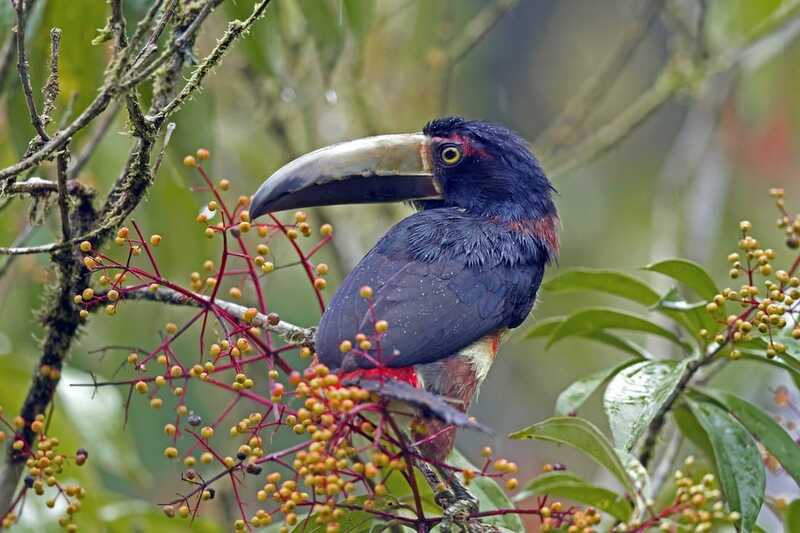 Two this month as there are in fact many to choose from the Costa Rica trip. I was pleased to get a nice shot of a Surfbird sharing a rock with a Ruddy Turnstone for comparison. Surfbirds breed exclusively in high mountains in the interior of Alaska, but they disperse along the entire Pacific coast of the Americas in Winter, from Alaska all the way down to Southern Chile. 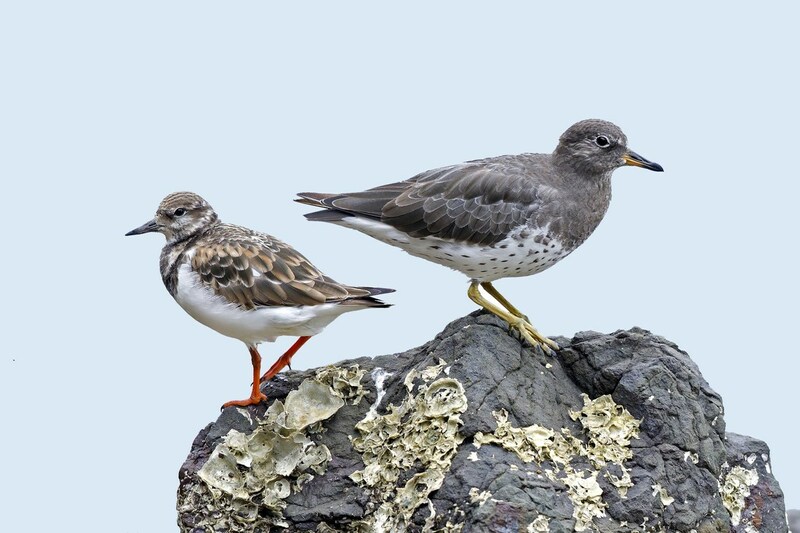 Nowhere common in Winter they are usually seen foraging on wild rocky coasts in breaking seas, hence the name. 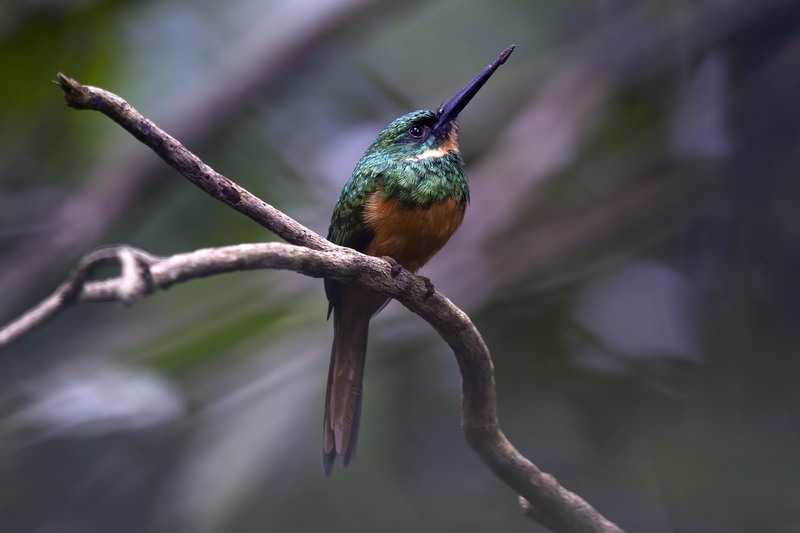 .....and the Rufous-tailed Jacamar is a beautiful bird of forest edges and clearings. It feeds on large flying insects such as dragonflies and moths which it catches by flying out from a perch. I photographed this one in the forest at Carara national Park on the Pacific Coast.